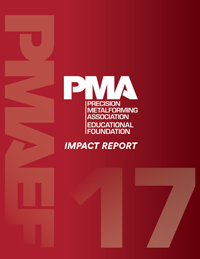 The PMA Educational Foundation Board of Trustees wishes to extend its sincere appreciation to the following companies and individuals for their generous commitments to the foundation’s original Campaign for Workforce Development, launched in 1997, with contributions of more than $2 million to the PMAEF Endowment. Brown Corp. of America Inc.
A. J. Rose Mfg. Co.
Ohio Stamping & Machine Co., Inc. The Quarterly Club Vibro/Dynamics Corp.
Atlantic Tool & Die Co.
Bennett Tool & Die Co.
GR Spring & Stamping Inc.
Minneapolis Washer & Stamping, Inc. The Quarterly Club in memory of Jim McGregor Ralco Industries, Inc.
E & E Manufacturing Co., Inc.
Nels and Liz Leutwiler Morrissey Inc.
ODM Tool & Manufacturing Co., Inc.
W & H Stampings & Fineblanking, Inc.